You’ll find some great material in Nancy Tompkins popular book, Prone and Long-Range Rifle Shooting, and Mike Ratigan offers excellent wind-reading advice for 100/200 yard BR in his new Extreme Rifle Accuracy book. 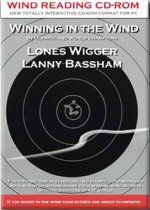 But for those seeking a single, dedicated resource on wind reading, we recommend Winning in the Wind, an interactive DVD by Lanny Bassham and Lones Wigger, both World shooting champions. Winning in the Wind covers mirage and the strategies for shooting in different wind conditions. The DVD has over 100 digital graphics, photos, and ilustrations, plus a complete interactive shot chart showing wind effects. The DVD also offers helpful hints for staying positive and mentally focused when dealing with fickle and erratic winds. This CD-Rom is available for $35.00 from Champion’s Choice, or directly from the Lanny Bassham website, MentalManagement.com. This DVD and other Lanny Basham motivational products are available on Amazon.com.